By Singyin Lee in People. Updated on March 5, 2016 . Have you found your soulmate, your better half, the ONE? Thinking about a special way to pop the question, a way that the girl of your dreams will remember for all times? The season of love is here and to celebrate the beautiful promise of eternal love, we’ve gathered 5 amazing proposals love-stricken men have thought up to pop the question. The grooms-to-be went to great lengths to make the proposal as memorable, heartfelt and as NO-proof as possible. Warning: if you are prepping for a wedding proposal that has to do with flowers, dinner and a ring, you might want to skip this post because this is going to totally ruin your plans. For the rest of you, if weddings make you cry, there is a slight probability that some of these proposals might make you shed a tear or two. Grab a box of tissue and check out these beautiful wedding proposals you have to watch. Now, THAT’S how you propose. Wedding videos are becoming more and more of a norm but when it comes to wedding proposals, it’s usually more of a personal keepsake. However, it’s a good thing Timothy Tiah, co-founder of Nuffnang decided to share the Meme proposal video that helped him snag the heart of his then-girlfriend and meme fan, Audrey. Timothy had surprised Audrey by appearing outside the place she was dining at. Through the glass of the main door, he stood with printouts of memes and a string of stories that led him to finally pop (I think it counts even if he didn’t really say it out loud) the question, "Will you marry me?". 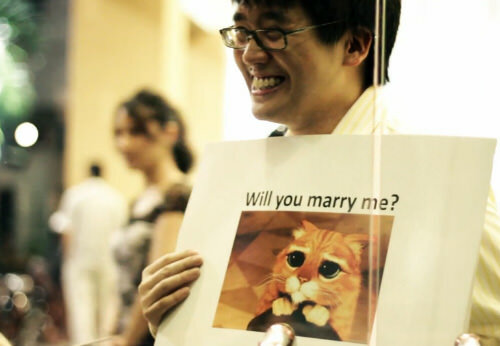 Watch how he proposes Like a Boss. The string of memes came complete with a last meme of Success Kid and the tongue-in-cheek message, "Asked Audrey To Marry Me, She Said Yes". At the end of it there was still the down-on-one knee, the ring and the flowers to make it all complete. Plus, the Up-themed wedding reception was simply beautiful. As the title suggests, there was a skyscraper involved. But the proposal wasn’t a billboard or a banner (that would be boring). This one is more high-tech, but it doesn’t diminish the heart factor. It starts with Marzo (last name not found) taking a video of his unsuspecting girlfriend on a pleasant evening walk. He then makes her take a phone call in which she has to say her name, Lisa, and say Hi. She does and the person on the line hung up on her. Well, that was rude. Marzo then directs her attention towards a tall building nearby. Watch the lights go out in the video. 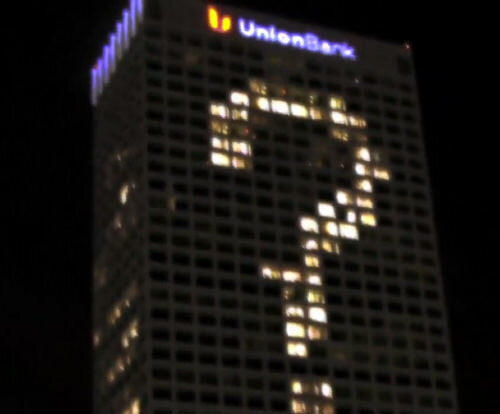 The lights went out one by one in the whole building (which must have been about 30 storeys high) then her name came up, followed by a very important question, "LISA, WILL YOU MARRY ME?". Through giggles and tears, Lisa says Yes and drops her bag of Doritos and they live happily ever after. Ok, we have no way of knowing that but watch the clip until the very end. You know he is going to make her happy for the rest of her life. You know how it is when kids ask their dads about how he proposed to their moms? Was it romantic, was it interesting, was it plastered all over a heavily graffiti’ed wall on a busy New York city street? Photographer Jeff Gurwin can say yes to all three. Some proposals are well-thought out and over in minutes, but Jeff’s idea took 6 hours from start to finish. Since the both of them are big fans of the board game Scrabble (it’s like an offline version of Words with Friends), he decided to use the letter tiles to spell out his proposal. Only difference is, rather than spelling it out on a board game, he painted it onto a wall. Watch a masterpiece in the making. The video shows a time-lapse of the mural in the making. 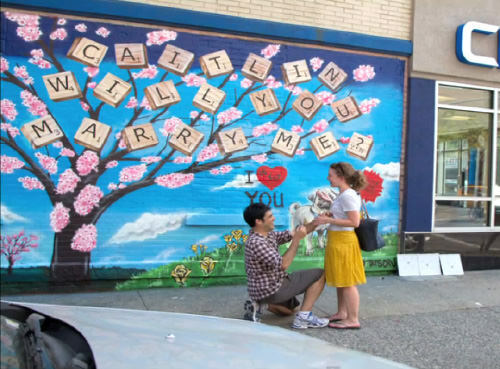 From a graffiti backdrop, the wall turned into a tree, which blossoms out into Scrabble tiles that spell out "Caitlin Will You Marry Me?". Lucky girl Caitlin sees the proposal, runs across the street, stands in front of Jeff (down on one knee) and said yes. It’s a good thing she said yes too, because the mural was supposed to stay up on the wall for a whole month. Talk about making a commitment. This was burning the Web like no other proposal but if you haven’t seen it yet, let’s just say that you are going to enjoy this proposal even if you aren’t the girl. It was picked up by the news and already has 17.8 million views as of this writing. Isaac Lamb and now-wife Amy even produced a follow up video to thank everyone for their help and for watching the video. 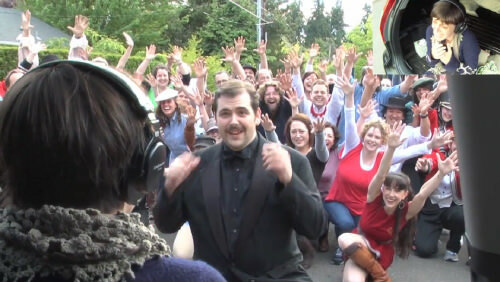 The proposal began with the victim, soon-to-be proposed to Amy, being placed onto the back of a car by her brother. He puts headphones on her and placed two cameras, one from behind her and one right at her, before the car rolled down the street at walking speed. Watch how the choreography got the girl. What transpired afterwards was an amazing 60-people dance choreography, live dubbed to the tune of Bruno Mars’s "Marry You". The 4-minute dance came complete with dancing Jews (yes, we know the lyrics said juice), a marching band, and friends joining in the performance via video conferencing. At the end of the song, the dashingly dressed Isaac walked up to Amy, got down on knee, and popped the question. In retrospect, it isn’t really fair: How do you say No to that? Some of you may think it old school to ask the father of the bride for permission to marry his daughter, but when you think about it, nothing says "I respect the future mother of my kids" more than by doing this. Well, Matt took that to heart then took it a little bit further, by turning it into a movie trailer that is screened in actual cinema. Grab some popcorn. Ginny was taken to the movies by her brother and as usual, cinema-goers are treated with movie trailers for future releases. She sees a movie trailer about a man talking to his future father-in-law to ask for his blessing and his daughter’s hand in marriage. "It may be old-fashioned, and it might not even be necessary but it is important to me, and I know it is important to your daughter that I do this." Only after the permission was granted did the camera came into focus to reveal Ginny’s father. Watch the mother of all proposals here. But that’s not all, what’s a good movie without some action and humor? Matt proceeds to get in a car and speeds towards the cinema, stopping to get popcorn, then bursts dramatically into the theatre Ginny is in. And the camera cuts to live action. Matt gets to where Ginny is, gets down on one knee, proposes, and Ginny says Yes! And get this, Matt and Ginny are now parents to… yup, a beautiful baby girl.